12V 14W Portable Solar Power Panel Kit. This Solar Panel can be folded for easy storage and carrying around. It comes with a car cigarette lighter female socket adapter and will be perfect for any 12v chargeable device that requires 14 watts and under power. Folded Dimension : 230 x 220 x 40mm or 9.2" x 8.8" x1.6"
Unfolded Dimension: 660 x 450 x 5mm or 26" x 18" x 0.2"
This solar panel maximum output is 14W and maximum output voltage is 12V. However, since the sun does not always strike it straight on solar panels and we can't count on getting the full 14 watts and 12V power all day. Early in the morning and late at night solar panels have a much reduced output with maximum output near noon. If you want to use the solar panel to power your devices directly, please make sure your devices can work under unstable power source. 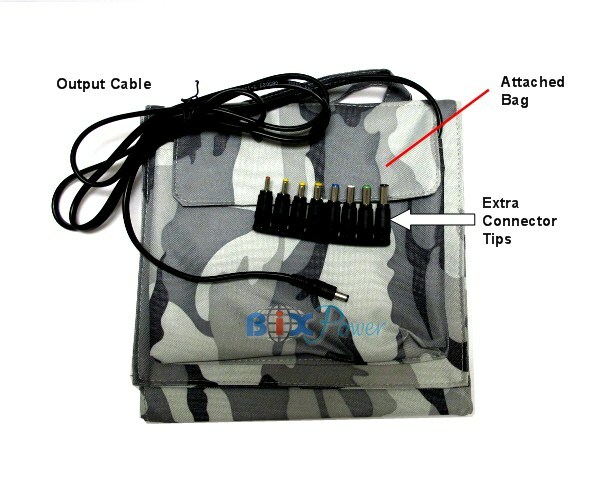 The recommend way to use the solar panel is using the solar panel with compatible external battery packs, charge the external battery packs with this solar panel and store the power generated by sun to the battery packs, then use the battery packs to power your devices anytime anywhere. We have specially designed battery packs that can accept wide range varied inputs and can be used together with solar panel to store the power generated by the solar panel .